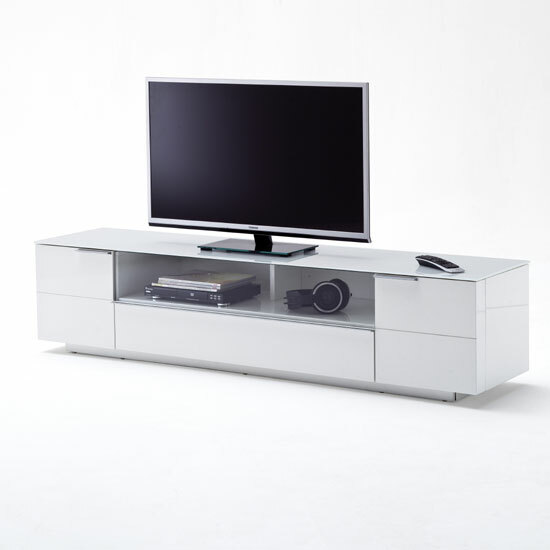 Most wood TV stands – glass doors or glass shelves – are designed in an unobtrusive, traditional style. These models do not have much decorative inserts or ornaments of any kind. They usually feature basic functionality, and the only thing that makes them special is a beautiful natural wood shade. There are plenty types of wood for a variety of interior palettes: light pine; yellow oak; brown walnut, etc. At the same time, there are plenty of wood TV stands with glass doors that look ultra-modern. The look is achieved with the help of stylish accessories – for example, glass display shelves can often be highlighted with bluish LED lights. If you do not like blue, it is possible to go with practically any other color. Walnut, for example, looks great with green LEDs. It is even possible to find TV stands with distinct vintage look. The most common wood types would be mahogany and oak. Both are great solutions for vintage environments, even though the shades these models feature are very different. Also, you should note that vintage stands do not really look like stands – more like sideboards. Finally, both modern and traditional (even a couple of vintage) wood TV stands with glass doors can also have trapeze, corner shape. This is one of the most compact arrangements in the furniture market, so if your room is not very spacious, you should give it some thought. Plus, a corner cabinet features greater storage capacity in comparison to rectangular cabinets. A nice selection of wood TV stands – glass doors or no doors at all – can be found at Furniture in Fashion online store. The main thing that makes this e-commerce platform different from the other sites is that it ensures quick delivery to any part of the UK. This is a local company with its own showroom, warehouse, and even a set of internal couriers – and a combination like this is rare for the majority of online stores. The fact that the company owns the warehouse instead of renting one also ensures that at least 90% of all listed products are physically in stock, which is another important benefit. At the same time, the company manages to keep its prices affordable without compromising on the quality of the distributed goods. The store has a carefully selected database of furniture manufacturers from the UK and Europe, and all of the listed products are in full accord with high international quality standards.